(14.7" x 9.7" sepia jpg, 7.2 MB). Photo by Irene Young. and Ian Dogole (world percussion). Ancient Future's core world jazz rhythm section was involved in five Ancient Future studio CDs which have each played an ongoing role on the development of world jazz. For example, Dreamchaser, the first major label release by this line up of Ancient Future, debuted at #2 on the Jazziz National Airplay Chart. On June 7, 2011, Capitol Records digitally reissued World Without Walls, their classic 1990 release featuring world music legend Zakir Hussain on tabla, to celebrate the start of their 'World Without Walls' Reunion Tour. Putumayo Records included songs from Ancient Future's 1993 release, Asian Fusion, on samplers in 2000 and 2005. The virtuoso music of Ancient Future is an exhilarating mix of jazz improvisation and the exciting rhythms and exotic sounds of world music. Ancient Future has performed hundreds of concerts throughout the U.S.A., headlining such venues as New York City's Carnegie Recital Hall, San Francisco's Great American Music Hall, and Eugene's Hult Center for the Performing Arts, and appearing at jazz festivals such as the San Francisco Jazz Festival, Marin Jazz Festival, Sacramento River Jazz Festival, Cotati Jazz Festival, Valhalla Jazz Festival, Sand Harbor, On the Waterfront, and many others. They were the subject of features in music publications from JAZZIZ (USA) to MUSICA GLOBAL (Spain). 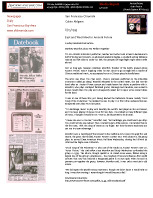 Selected excerpts from this press coverage are available in the archives from this period of Ancient Future history. Ancient Future's world jazz is equally at home on any jazz bill, be it experimental, contemporary, or firmly based in tradition. The group has shared bills with other leading jazz and contemporary music artists including Fourth World with Flora Purim and Airto, Tower of Power, Craig Chaquico, Acoustic Alchemy, Tania Maria, Shadowfax, Ottmar Liebert, Freeflight, David Grisman, Zakir Hussain's Masters of Percussion Tour, and Strunz and Farah. Recorded October 16, 2013, at Ancient Future's 'World Without Walls' Reunion Concert at the Freight and Salvage in Berkeley. Shown: Doug McKeehan (piano), Kash Killion (bass), Ian Dogole (percussion), Matthew Montfort (scalloped fretboard guitar), Jim Hurley (violin), and Mariah Parker (hammered dulcimer). 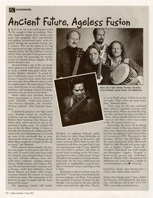 Recorded June 7, 2011, at Ancient Future's 'World Without Walls' Reunion Concert at Yoshi's San Francisco. 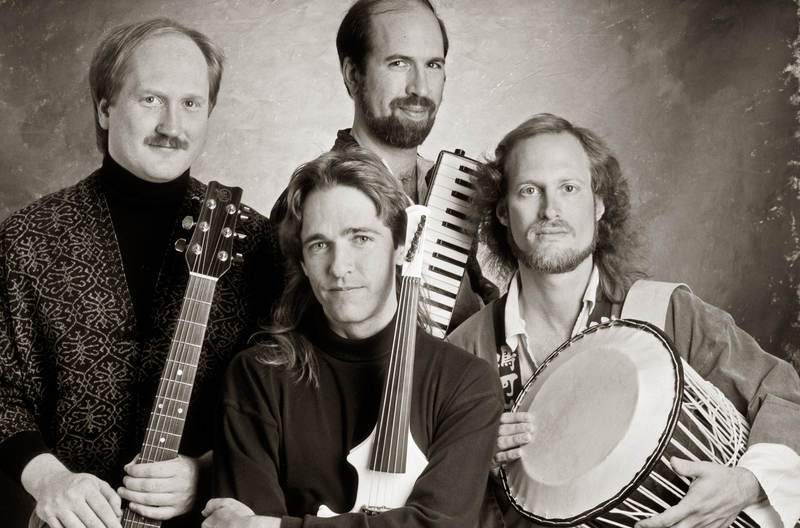 Shown: Doug McKeehan (piano), Kash Killion (bass), Ian Dogole (percussion), Matthew Montfort (scalloped fretboard guitar), and Jim Hurley (violin). >YTmusic (World Jazz repertoire). Studio recordings of the repertoire played by this band variation of Ancient Future. Bookenka (The Adventurer) (Doug McKeehan. 5:18). >YTmusic. This contemporaryjazz radio hit combines a Japanese mode with elements of jazz. From Asian Fusion (Narada Equinox ND-63023). CD- $24.98 (out of print: collectable signed reconditioned copy): Add 1 to Cart. Buy 1 Now. Mezgoof (Ian Dogole. 6:20). Based on Qawwali, a Sufi devotional form of music popular in Pakistan and India. FREE MP3 (excerpt) 800K. >YTmusic. From Asian Fusion (Narada Equinox ND-63023) CD-$24.98: Add 1 to Cart. Buy 1 Now. Lakshmi Rocks Me (Jim Hurley. 2:52). FREE MP3 (excerpt) (992K). >YTmusic. Energetic tribute to South Indian violinist L. Shankar featuring Zakir Hussain and Jim Hurley. From World Without Walls (Sona Gaia/MCA 163). CD- $24.98 (out of print: collectable signed reconditioned copy): Add 1 to Cart. Buy 1 Now. So Near, So Far (Doug McKeehan. 5:59). >YTmusic. Piano, violin, African talking drum, and guitar evoke that feeling of not quite being there. From Dreamchaser (Sona Gaia/MCA 154) CD- $29.98 (very limited remaining stock: out of print): Add 1 to Cart. Buy 1 Now. Gamarock (Matthew Montfort. 6:25). FREE MP3 (excerpt) (896K). >YTmusic. Inspired on a study trip to Bali by the gamelan (percussion orchestra) music that fills the night air, and the Balinese love affair with a form of music known as rock and roll. What to you get when you cross gamelan with rock? You guessed it...Gamarock. The song includes a kotèkan (Balinese interlocking rhythm) from the Gamelan Anklung repertoire. From Dreamchaser (Sona Gaia/MCA 154) CD- $29.98 (very limited remaining stock: out of print): Add 1 to Cart. Buy 1 Now. April Air (Doug McKeehan. 3:57). >YTmusic. Steel drums and piano trade licks on Ancient Future's biggest contemporary jazz radio hit. From World Without Walls (Sona Gaia/MCA 163) CD- $24.98 (out of print: collectable signed reconditioned copy): Add 1 to Cart. Buy 1 Now. 14 Steps (Matthew Montfort. 4:30). FREE MP3 (excerpt) (1MB). >YTmusic. Fourteen beat rhythmic cycle creates a funky Indian groove featuring Zakir Hussain and Matthew Montfort. From World Without Walls (Sona Gaia/MCA 163) CD- $24.98 (out of print: collectable signed reconditioned copy): Add 1 to Cart. Buy 1 Now. Ode to Ajanta (Ian Dogole. 4:58). >YTmusic. Ode to the ancient cave temples of Ajanta. From Dreamchaser (Sona Gaia/MCA 154) CD- $29.98 (Very limited remaining stock: out of print): Add 1 to Cart. Buy 1 Now. Turkish Taffy (Doug McKeehan. 4:55). >YTmusic. Sweet and chewy combination of jazz and Middle Eastern influences.From World Without Walls (Sona Gaia/MCA 163) CD- $24.98 (out of print: collectable signed reconditioned copy): Add 1 to Cart. Buy 1 Now. Ladakh (Doug McKeehan. 4:22). >YTmusic. Drawn from the folk music tradition of Ladakh, a remote mountainous region of Western Tibet. From Asian Fusion (Narada Equinox ND-63023) CD-$24.98: Add 1 to Cart. Buy 1 Now.